Year of appearance: 1840. In Portugal, the Pena Palace is a landmark of national significance. 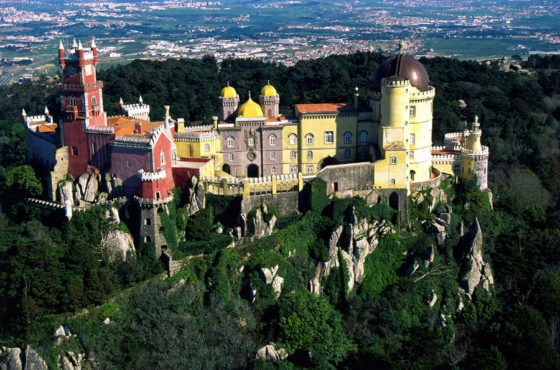 It is located in the immediate vicinity of the town of Sintra, the palace was built on top of a rocky cliff in 1840. Externally, the palace resembles the classic medieval castle, while his real age barely exceeds 150 years. The initiator of the construction of the fortress was the king Fernando II, who used the majestic building as a summer residence. Initially, in the rocks, where it was decided to build a castle, it has a small old monastery. At the time of the start of construction for many years he was in disrepair, so nothing prevented begin to build in the rocks majestic building of impressive proportions. The last owner of the castle was Queen Amelia in 1910 she was forced to leave his residence and flee from Portugal. In many rooms and halls of the palace managed to save the situation, which took place during the last owner. After the revolution the palace was converted into a museum, it holds an interesting collection of works of art, antique furniture and jewelery. Walking through the extensive grounds of the palace, too, will give a lot of impressions, you can endlessly admire the carved arches in the Moorish style, antique sculptures and landscape decorations. Surrounds Palace massive forest, an area of over 200 hectares. At different times, the owners of the castle were planted on its adjacent territory a lot of exotic plants, so the excursion nature lovers.